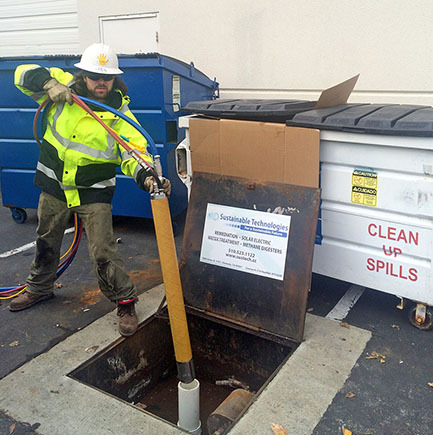 Air stripping is widely used to remove volatile contaminants from groundwater. 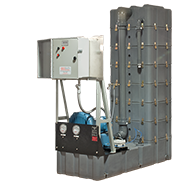 Geotech LO-PRO™ models II and III are highly efficient water treatment systems that can remove up to 99.99% of many volatile organic compounds (VOC's) from water. Systems are self-contained for use in limited space applications. Lowering a Geotech Auto-Reclaimer AR4 into a well. The Grundfos Redi-Flo3™ Submersible Pump is ideal for the removal of polluted groundwater. Users have the capability to change the pump performance while the pump is installed in the well. Typical applications include: environmental remediation, leachate extraction, total fluids recovery, tank-to-tank transfer, and sampling. Systems are available for your portable or dedicated pumping needs.